A few months ago, I spent an evening playing Versus mode in Left 4 Dead. It was the No Mercy campaign, and the survivors had just blown up the gas station when I spawned as a Boomer. "Perfect," I thought. "When they trigger the crescendo event and run across the awning, I can puke all over them without being seen." I climbed up to the roof and waited. And waited. It wasn't until I heard the survivors fighting our Tank inside the warehouse that I realized they had somehow skipped past that entire section of the level. I asked my teammates what happened, and someone stated sourly that the survivors had used the "shutter door exploit." Apparently, the door leading into the warehouse - one that was only supposed to be operable from the inside - would break after exactly 67 melee attacks. This was obviously not the developers' intent, but it's pretty typical in an environment where players will use every trick available to them to win. It's a lot like performance enhancing drugs in a sports league: Athletes may not want to cheat initially, but the prospect of their opponents taking advantage of underhanded tactics is enough to encourage cheating to even the playing field. Thankfully, the shutter door exploit has since been fixed. 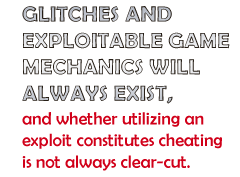 However, glitches and exploitable game mechanics will always exist, and whether utilizing an exploit constitutes cheating is not always clear-cut. Sometimes, the person using the exploit isn't even aware that what he is doing is questionable. Many players strongly believe that any tactics allowed by the software are fair game until the developers fix it. There is some merit to this opinion, especially regarding techniques that straddle the fine line between "clever use of game mechanics" and "blatant exploits." In the absence of developer input, communities generally permit strategies that don't give an insurmountable advantage to one team or another. Take "tank juggling" in Left 4 Dead, where the player who spawns as a Tank repeatedly knocks nearby cars into the survivors. Currently, most players consider it a fair tactic, even though the guaranteed knock-down effect is a bit unbalanced and, thanks to random spawn patterns, there's no guarantee the opposing team's Tank will spawn close enough to a group of cars to be able to take advantage of the mechanic. But since it still takes skill to execute - and since experienced Survivors still have a good chance of overcoming a "juggling" tank - it's allowed, if dreaded.